This extra smooth, herbal eye-definer from Himalaya has been enriched with almond oil for perfect eye care. Himalaya’s Kajal is waterproof and can be applied easily as it glides along the lash line smoothly. Its gorgeous dark colour highlights your eyes and defines them naturally, keeping them fresh and bright. 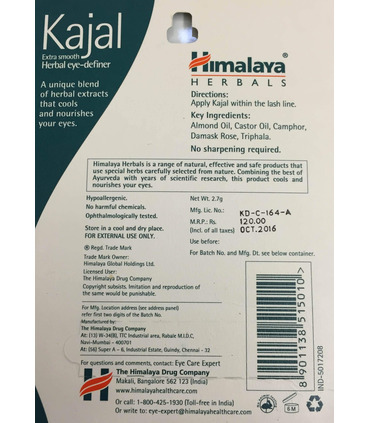 Himalaya Herbal’s Kajal contains the following, nourishing ingredients, and is believed to have the following benefits: - Almond Oil nourishes lashes and also acts as an anti-aging agent for the eyelids. - Camphor helps keep the eyes hydrated. - Castor Oil is a skin softener that also protects the eyes from wind, dust and dry air. - Damask Rose is known for its cooling properties, thus reducing eye strain. 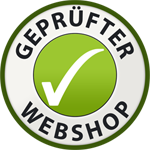 - Triphala is an Ayurvedic formula that blends three fruits - Haritaki, Amalaki und Bibhitaki. 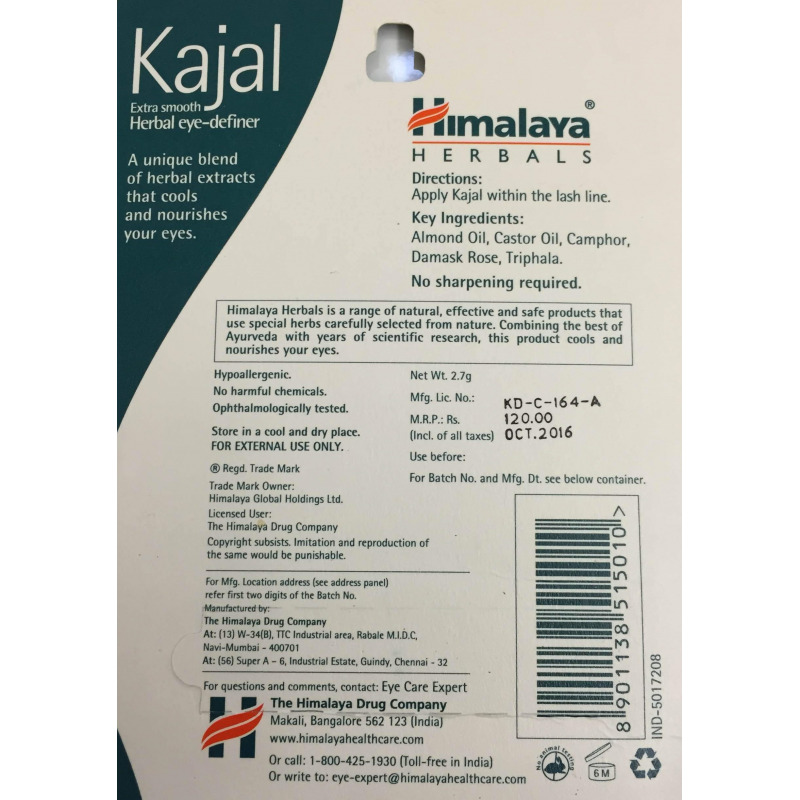 It has anti-inflammatory properties and helps reduce eye redness and swelling. 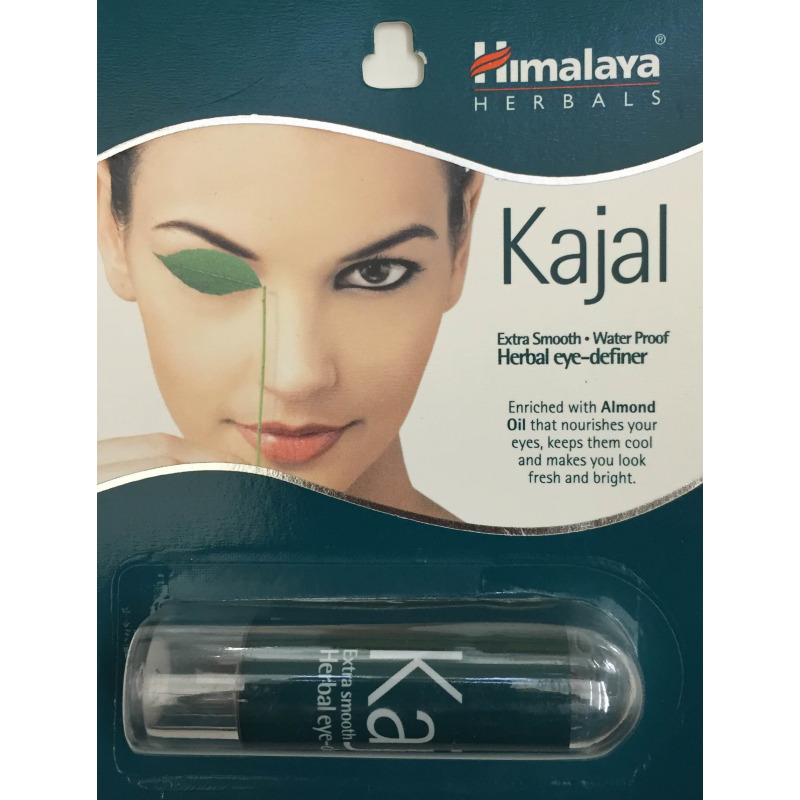 This extra smooth, herbal eye-definer from Himalaya has been enriched with almond oil for perfect eye care. 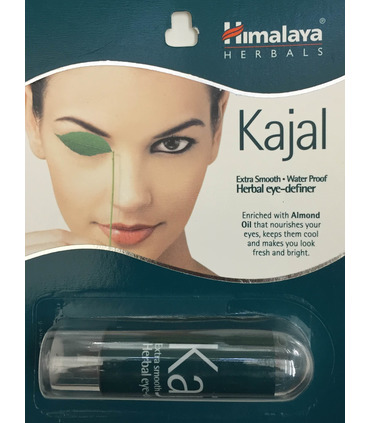 Himalaya’s Kajal is waterproof and can be applied easily as it glides along the lash line smoothly. Its gorgeous dark colour highlights your eyes and defines them naturally, keeping them fresh and bright. - Almond Oil nourishes lashes and also acts as an anti-aging agent for the eyelids. - Camphor helps keep the eyes hydrated. - Castor Oil is a skin softener that also protects the eyes from wind, dust and dry air. - Damask Rose is known for its cooling properties, thus reducing eye strain. - Triphala is an Ayurvedic formula that blends three fruits - Haritaki, Amalaki und Bibhitaki. It has anti-inflammatory properties and helps reduce eye redness and swelling.